You’ve got the whole world — or at least the lives of millions — in your cup. Lately, with the growing sophistication among those with the jones for java, another question has been added to the list of preferences — fair trade or not? And the answer to that one is reverberating around the globe, in the economies of countries, and in the lives of people who grow the beans that make the drink that seems to fuel the world. The fair-trade movement, with its objective of providing a living wage to coffee farmers and workers, is that rare animal, a social reform movement that is actually making a significant difference for millions of people. It may be on the precipice of changing the worldwide coffee landscape — though not without controversy. The movement is gaining momentum every year, another reflection of the trend of consumers caring more about the ethics involved in the food that lands on their plates and in their Styrofoam — or, make that their recycled paper — cups. 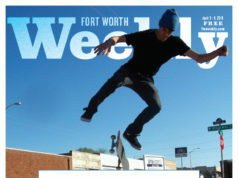 In Fort Worth, more and more restaurants, cafés, and a surprisingly wide swath of retailers stock fair-trade coffee brands — and proudly announce the fact. Just as the organic food movement has grown popular enough to convince companies from Target to Tom Thumb to offer organic produce, the fair-trade wave has spread far beyond the usual suspects of Starbucks and organic coffee merchants like Equal Exchange, in Massachusetts, and Green Mountain coffee, based in Vermont. The new occupants of the fair-trade bandwagon include companies like Dunkin Donuts, Nestlé, Wal-Mart, and Newman’s Own, which contracts with Green Mountain to provide some of McDonald’s coffee. Some local churches are even promoting the cause to their congregations. Owner Amy McNutt found the fair-trade movement a natural fit in her restaurant. “The first time I ever heard of [Fairtrade] was at the Organic Consumers Association,” she said. “They started a boycott of Starbucks eight years ago. I never even thought about where coffee is from and who picks it before that.” Neither did most Americans, or most coffee drinkers outside the coffee-producing world, for that matter. For many years, coffee prices — and therefore the fortunes of coffee workers — remained relatively stable. 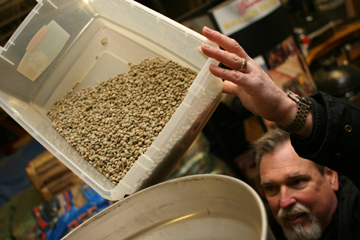 The average wholesale price of coffee remained in the range of $1.20 to $1.40 per pound, courtesy of something called the International Coffee Agreement, a system of quotas that, not unlike OPEC’s influence on the oil market, balanced out supply and demand and enabled producers to pay decent wages while earning modest profits. But in 1989, with the end of the Cold War, industrialized countries and large corporations decided to abandon the agreement, allowing the market to determine prices and production levels. The result was a disaster, at least for the millions of people at the bottom end of the coffee-supply chain. While retailers were turning coffee from a morning staple into a luxury all-day drink at boutique prices, wholesale prices plummeted to roughly 50 cents a pound. The fall was a harbinger of humanitarian, environmental, and immigration disasters. Desperate governments urged coffee growers to overproduce, thus flooding the market. On top of that, state-run coffee producers from Vietnam and Papua New Guinea began to export coffee for next to nothing. Export income fell at a pace of more than $200 million per year across the Latin American region. Financial institutions buckled under the weight of high interest rates and outstanding debts. By 2004, labor demands in the coffee industry had fallen dramatically, and more than 170,000 full-time jobs were lost in that year alone, according to Global Exchange, a human rights organization that also sells Fairtrade coffee. Many Central and South American coffee producers began to take their land out of production, turning it to other uses or abandoning it altogether. Some sold out to larger companies for a fraction of what the land was worth. In September 2002, Nicaraguan day laborers, many of whom had not worked for months, blocked the Pan-American Highway, in protest of their having to work for food on coffee farms. The demonstration by more than 3,000 workers lasted 10 hours and led to some important negotiations. But protests are few and far between in the coffee-producing world. But in other communities, Robinson said, Fairtrade is successfully enabling farmers to stay home. “If not for Fairtrade, these farmers would be risking their lives crossing the border,” she said. “It’s keeping them in the communities, with their families, and farming” and promoting stronger communities and more environmentally friendly farming at the same time. To say that the Fairtrade movement has a broad church is not an exaggeration. In fact it has found an ally in churches everywhere — like the First Jefferson Unitarian Church on Fort Worth’s East Side. 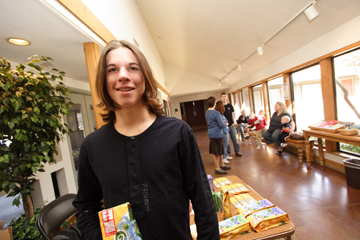 As part of its efforts to raise social awareness, the church’s youth group sells Fairtrade products to the congregation. “It’s really opened my eyes about how much products affect the environment,” said the youth group’s leader, Austin Watt, 16. He sells about 20 items a week, including coffee, cocoa, and tea, to his congregation. According to Amanda Robinson, the church’s director of religious education, the entire flock has embraced the idea. “We try to put out some information so that people will know what it’s about and why it’s important,” she said. The fair-trade movement has affected the congregation’s offering plate — “What’s happened is that on Sundays we’re getting a lot more donations for the coffee because they know that it is a social justice issue,” Robinson said. The history of fair trade—or fairly traded goods—began with faith-based organizations selling above-market-price goods to their communities in the 1940s. They took the money they earned and used it to help the poor and needy. Sue Schroeder, who manages the gift shop at the First Cathedral of Hope UCC in Dallas, is continuing that tradition. “What we’re trying to do is educate our congregation that they need to begin being sensitive to what’s happening to people all over the world,” she said. The gift shop started selling the coffee six months ago, and the church’s 4,000-member congregation has been very supportive, she said. The Fairtrade label started in the Netherlands in 1988. The company called itself Max Havelaar, after a character from a 19th-century novel about the mistreatment of coffee pickers in Dutch colonies in Africa. In 1997, the Fair Trade Labeling Organization (FLO) brought Max Havelaar together with its counterparts in other countries. FLO certifies the producers, while Transfair USA, the American arm of the FLO, and 19 other international labeling organizations certify the products. The movement is designed to create a more equitable relationship between coffee consumers in developed countries and the coffee producers, who are generally in poorer countries in Africa and South and Central America. It guarantees that farmers will be paid a fair price for their harvest, regardless of what the notoriously volatile coffee market is doing. The FLO acts as a go-between, connecting farmers with buyers. According to the Transfair USA web site, the company has channeled some $85 million in above-market revenue to approximately 5 million farmers, in 60 developing countries. 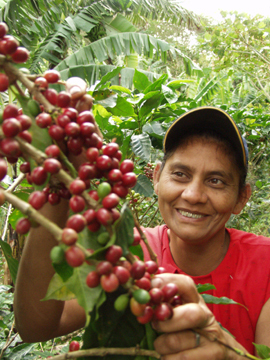 Fairtrade works through cooperatives of hundreds of small land-owning farmers. The co-ops are paid a minimum price of $1.26 per pound of coffee, or five cents above market value if the market goes above that. The cooperatives must adhere to a strict set of FLO policies covering labor conditions, fair wages, and environmental stewardship. Each farmer gets a vote on how to spend the profits. In turn, the producers are obligated to reinvest in their own communities. The Fairtrade label lets consumers know that that the coffee they are buying was produced under good working conditions. Its main tenets fly in the face of business as usual by putting as much emphasis on social responsibility as profitability. Most of the cooperatives in Latin America are seeking to be certified under many versions of environmental and humanitarian criteria — as Fairtrade, Organic, Shade-Grown, Bird Friendly, and Eco-OK coffee growers, for example. The environmental standards of FLO are some of the more controversial elements of the certification process. Farmers are required to implement environmentally sustainable farming methods that, according to TransFair USA, “protect the farmers’ health and preserve valuable ecosystems for future generations.” Farmers are also responsible for protecting wildlife, intercropping (a farming technique designed to reinvigorate the soil), and adhering to a host of other eco-friendly regulations. Women are particularly benefiting from the co-ops. Researchers at Colorado State University found that all the co-ops they studied had explicitly addressed gender issues — in part because of the concerns expressed by many international donors and FLO certifiers about women’s rights in the coffee-growing communities. Women’s groups were started in several towns the researchers looked at, addressing topics like healthcare, education, and the coffee business. However, the study did point out that women still do not play an important role in the decision-making process for their co-ops. Nicole Chettero, public relations manager for TransFair USA, pointed out that because Fairtrade is becoming more mainstream, more farmers are getting the help they need. “We certify products, not companies,” she said. “Whether the coffee is being sold at Starbucks or Equal Exchange, the farmer is still getting paid the same price. The coffee is still being grown sustainably without the use of harmful chemicals.” She also said that because consumers are becoming more conscious of the ethics behind trade, big companies have had to change the way their transactions affect farmers, workers, and the environment. There are countless opponents of Fairtrade. Many business-friendly critics believe that the practice of paying above-market prices ignores time-honored economic indicators regarding over-production and hurts non-Fairtrade farmers. They also charge that it is an inefficient way to get money to poor farmers — that only 10 percent of the money earned from the sale of Fairtrade products ever reaches the farm, according to economist Tim Hartford, who authored a book on the subject. Other critics point out that the movement has become a cluttered, slow-moving bureaucracy. The certification process is considered too stringent by some, who claim that the environmental standards are impossible for some of the poorest farmers to achieve. Though the buyers typically finance the transition, the process is long and sometimes involves losing crop yields. The turnover process from a non-Fairtrade farm to a Fairtrade farm can take up to seven years, because it takes that long for agrochemicals to naturally work their way out of soil. Farmers are also obligated to adhere to a prohibited materials list that reads like a phone book. Another problem that critics have with the certification process is that, in order to qualify, small farms must be grouped into cooperatives, and member farmers each get one vote on how to spend the profits. Large plantations and mid-size family farms are not eligible for certification, which means that the plantation workers, who arguably need help the most, are not getting it. Also, all of the money goes back to the co-ops, not the individual farmers, so there is no reward for working harder and having a better product than a neighboring farmer. Chettero believes that the cooperative model is the best way to effectively deliver the benefits of Fairtrade. “If they are unorganized and isolated, not only are they not going to get direct market access or have voting power, but it’s not an effective way of distributing the wealth throughout the community,” she said. “It’s inefficient and difficult to create the market linkage and have the capacity to deal with large-scale businesses.” She also points out that non-certified farmers are benefiting from the proliferation of Fairtrade co-ops, because they are getting more reliable information about the market, so they are less likely to be cheated. Critics such as Hartford assert that Fairtrade doesn’t cut out the middleman but just replaces him. Moreover, they point out that the FLO charges between $2,000 and $4,000 to check out the co-ops, in addition to annual recertification fees and a small percentage taken off the top for each pound of coffee. The producers get an average of $1.46 per pound, according to TransFair USA. So the bulk of the money that a consumer spends is still going to the retailers, who slap an extra mark-up on Fairtrade coffees. Observers like Rodak also note that Fairtrade doesn’t always mean higher quality. “Fairtrade coffees are not necessarily the best coffees, but they do help impoverished farmers.” Skeptics are quick to call attention to the fact that because of the fixed prices, there is no incentive for farmers to try to produce a better product. Often their beans are mixed together in order to mask any quality issues. They assert that the system breeds mediocrity and does not promote the idea of farmers learning about the business. 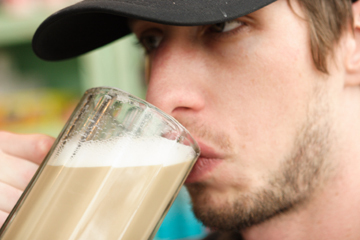 Many opponents of Fairtrade believe that the biggest problem with it is that too much coffee is being produced. The standard argument is that when the price of a commodity like coffee drops, it should indicate to farmers that they should switch to a different crop. However, being paid above-market value for coffee not only obscures this signal, but also encourages new producers to jump into the market, thus driving down the price of non-Fairtrade coffee, making those farmers even poorer. Beyond that, there are not enough buyers on the fair trade market. 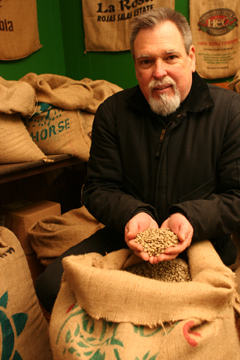 Many of the Fairtrade co-ops and individual farmers still have to sell a great deal of coffee to the bulk market. And they do not have to profit-share or reinvest in the community with that money. Also, Fairtrade certification does not necessarily bring buyers or pre-financing, which is vital to the production process. Some lenders will not finance Fairtrade growers unless they are also certified as organic, which is a costly and time-consuming process — although TransFair USA does give farmers financial incentive to do so. Advocates of Fairtrade are also drawing criticism. 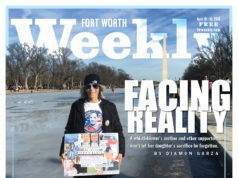 Some observers believe that a few people are crossing the line between activism and extremism. 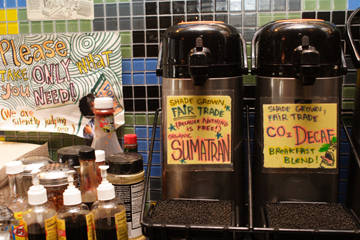 For example, in 2002, Global Exchange pushed a ballot initiative called Measure O, which would have required that all brewed coffee in Berkeley be certified as Fairtrade, organic, and shade-grown. In 2000, the group also launched a campaign against Starbucks — criticizing the company for not buying enough Fairtrade coffee — and the company got a reputation for mistreating farmers. At the time, the coffee giant bought 2.2 percent of the world’s coffee production and paid above-market prices, at $1.20 a pound, slightly less than the Fairtrade minimum. Since then, Starbucks has become one of the biggest clients of Fairtrade coffee. In 2005, the company bought 11.5 million pounds of it, accounting for 10 percent of all certified imports worldwide. At the Panther City Coffee House on Berry Street, assistant manager Jason Pollard believes that the Fairtrade process should be more inclusive. “The application fees and the certification fees for a lot of these impoverished areas is unattainable,” he said. “There are farms that are treating people fairly that don’t qualify.” He also said that he believes the intentions of Fairtrade are “very noble.” Panther City does carry Fairtrade and a host of other coffees that Pollard characterized as “fairly traded” but unable to meet the strict certification standards. Despite the good intentions of fair trade activism, every cup of coffee still contains untold amounts of hardship and woe. The majority of coffee farmers do not work in Fairtrade cooperatives. So for most laborers, the growing season means finding whatever work they can get, wherever it is. The fall of the market has turned these workers into excess humanity. Displaced workers scramble from plantation to plantation, country to country, constantly putting themselves in harm’s way to find work — in some cases, exchanging a day’s work for no more than a hot meal. Along the way, the migrants are subjected to robbers, thugs, and rapists. Families are often split apart. In Central and South America, that often results in a migration pattern that might seem ironic to U.S. citizens used to hearing about workers from Mexico coming to this country for better conditions. In the case of coffee workers, they often are pushed north into Mexico — because conditions there are better than at home. When the market drops in countries such as Guatemala and El Salvador, coffee farmers who aren’t part of the fair trade system, and plantation workers are forced to move elsewhere. Many of them go to Mexico or Costa Rica, where the customs and languages are familiar, and the pay is better — anywhere from $5 to $7 a day, compared to $2 or $3, according to the Americas Program at the Interhemispheric Resource Center. Mexico’s Institute of Migration determined that upward of 200,000 Guatemalans arrive in Mexico every year to work on coffee plantations. Faced with such an abundance of desperate foreign workers, Mexican coffee plantation operators have been able to drop their own wage rates — which in turn forces many Mexican workers north to the U.S. to find a living wage, further exacerbating our own immigration crisis. According to Equal Exchange, some 30,000 people from Chiapas, Mexico’s main coffee-growing region, cross the border illegally into the U.S. every year. The waves of dislocation and migration caused by the coffee market have had shocking results. 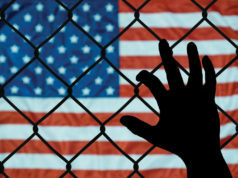 Many of those who die — or are killed — in the perilous journeys to this country are former coffee workers seeking an escape from their destitution. In May 2001, 13 Mexican coffee farmers from the Veracruz area died of heat exhaustion and thirst in the Arizona desert, after illegally crossing the border. Two years later, the bodies of 17 more migrant coffee farmers were found in and around an abandoned trailer in Victoria, Texas. The Center for Central American Resources in El Salvador said that between 1997 and 2000, the height of the coffee crisis, almost 25,000 Central Americans disappeared trying to get into the U.S. Since 1994, an average of one migrant farmer per day has died or disappeared trying to cross the Mexico-U.S. border. The illegal immigration is so serious that the United States has gotten involved in training Guatemalan government border agents to try to cut off the flow of refugees into Mexico from the south. The Mexican government has also stepped up its efforts to keep people from crossing illegally from their country to the U.S. And of course, in the U.S., border patrol agents, civilian “Minutemen” and a proposed fence provide another gauntlet to run. In many of the world’s coffee-growing regions, capitalism and democracy have come to seem intertwined in workers’ minds with economic abuse. Many of those who stay in their home countries are disillusioned with a system that has kept them poor for countless generations. Partly as a result, countries like Brazil and Venezuela have turned increasingly to a socialist system. Despite criticism and possible flaws in the system, the movement is growing exponentially. TransFair USA says that sales of Fairtrade coffee have more than doubled over the past two years, making it the fastest-growing segment of the U.S specialty coffee market. Retail sales in this country have grown from $50 million in 2000 to nearly $500 million in 2005. The organization has also claimed October for National Fair Trade Month. 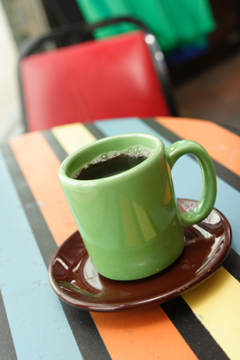 Today, close to 10,000 retail outlets and 200 universities in the U.S. offer Fairtrade coffee and other products. Two years ago, a student organization at TCU, called “Frogs for Fair Trade,” successfully lobbied the university to carry it. Rodak has a realistic approach to the movement. “Fairtrade costs us more; we usually don’t raise the price on it,” he said, sitting in a wood-paneled room filled with burlap bags of green, unroasted beans. “We just absorb the extra cost on it, and we look like good guys for doing it.” In this case, it seems, the coffee-buying public’s growing loyalty to a particular brand has at least a chance of working for the good of poor people all over the globe. “People buy what they’re sold,” Rodak said. You can reach Eric Griffey at egriffey12@yahoo.com. Next articleDid He Interview Himself?